Like princesses, imagination worlds, and dragons. Caspious was digging his weapon of choice into the earth. “Are you at war with those buggers again?” Istar teased, looking past him, her angelic figure sauntering up the path. He was tan, scientific and kind. Istar sighed. If only he was a smidgen more . . . obliging. When Caspious cared, his royal magic pierced all barriers; everything he caressed bloomed. Everything not hidden by her facade, at least. Istar scanned the treeline nervously. She couldn’t delay. “Sweet, the Syscans, surely you’ve heard. Without assistance they’ll die. Although they’re few, however distant and lowly, they’re still your subjects! You’re needed now!” I need you now! But that last sentence never actually left Istar’s tongue. Caspious was glad he turned from her mesmerizing eyes, resenting that Istar had opened this Pandora’s Box again. It had almost been their honeymoon’s undoing months ago. Wait–that was only months ago, right? The Heir shelved his lovely bride’s humming into its own compartment, focusing on the soil sifting through his fingers. He crunched what was left in his palm, imagining it was the worms he despised. Istar watched Caspious wane as she pleaded one last time. Maybe if he knew the truth of her past, he would reconsider his indifference. As Caspious often said (one of his gardening maxims), “One can’t unhinge the fly from the web.” And neither could she release her tongue from its curse, so frigidly bestowed on her, when torn from her family, discharged to the Castle by the Syscan Reds. The Reds had spent their patience. In a rare moment of honesty, Istar breathed “I love you,” startling Capious from his vegetation. But then she turned away quickly, hearing only the thump, rather than seeing his head roll too, as it joined his trowel on the garden plot. Red Sunset. CC2.0 photo by Petteri Sulonen. “Ready?” They gently gripped the pale flesh. Then, with the expert’s grim nod, from clavicle to navel, they cracked the laceration, divorcing the the woman’s body into two equal parts. It should’ve gaped black, even with the moonlight. But it roared red, yellow–even cerulean! “Quick, the damper!” The surgeon ordered, but the device sucked oxygen hopelessly as the hellfire raged. 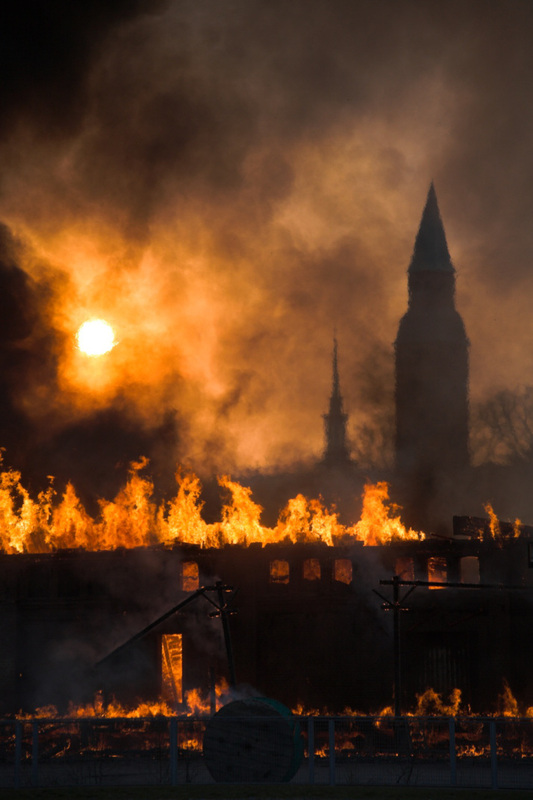 The surgeon stared, transfixed by the flame-entwined spires piercing through the heart’s pyre. She’d lived this inferno of anguish. 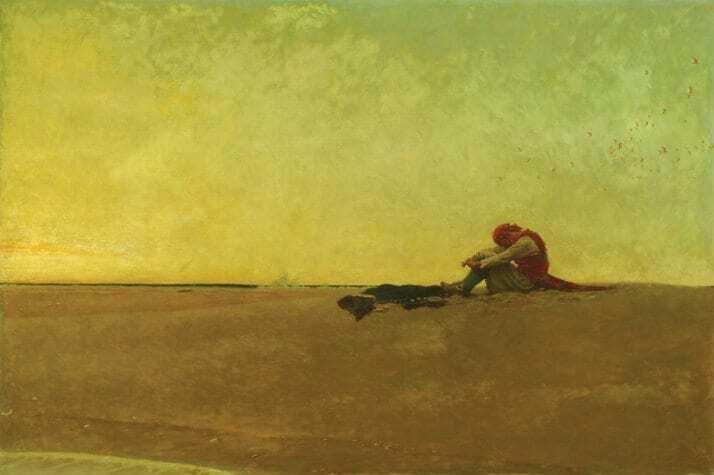 Marooned, by Howard Pyle, 1909. Public Domain. The brilliant sky set gold, a fitting backdrop for the swarming fireboon swallows sent by her magic to torment and nourish me. They made me long for her silvery touch, until I remembered what I was doomed to never forget. I was a sucker, like the rest of them. “Yes,” I said. “Please let me try,” I begged. Then, “I am strong enough,” I had insisted. And so I was wasted, send, and left. To be worthy to stand beside her, I must crack through the Sorcerer’s spell. So, daily I toil to break free. Like the others beside me, I push and fling myself against it, the barrier. At the day’s end on our respective sandy beaches, we, still like fools, hope. We aren’t watching, for she will not come. We were snagged in her siren’s snare and know we live eternally in these crafted bubbles. But we still wait for nothing under the saffron sky. This was written for Flash! Friday flash fiction. She traced her fingers over the darkest patch of midnight surrounding the bright fuchsia flowers patterned on her tunic. She wondered how the artists printed them on the swarthy cloth, if by ink, or brush or some other means, as the colors weren’t embroidered. If the council wasn’t so eternally contrary over inconsequential details maybe she wouldn’t loose herself so easily within her mind-fog. Her pinky glided over the next flower, but the argument still droned on ceaselessly. She stood up, silencing her advisers. Brushing the pine needles off her leggings she left the circle, kicking the can that had been holding her tea into the fireside flames. She left them stunned, as her tea sizzled behind her, but their hush still did not drown-out the roar inside. They might have guard positioning and defense plans to fuss about like crotchety old women over their vegetable gardens. But she had a hole ripped in her gut, because he left without a word, a breath, a eye-flick in her direction. How dare he. Her fists curled. 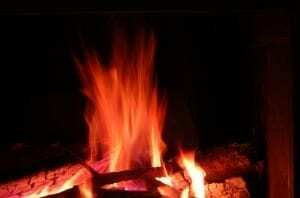 And it only heaped coals on her raging fire of loss within that the Ruinsfield Women were right. They warned her that it would happen like this, predicted it, even. But she just didn’t listen. Was it worth loving, knowing that equal amounts of pain would be the yin to her yang? What a terrible curse they mantled her with. By now, her council she’d abandoned behind the evergreens had begun to murmur. She shut them out, listening for any sound other than brutal humanity. She inhaled the forest air, deeply, permeating each molecule in her lungs. It didn’t satisfy. She sucked in air. Deeper. Deeper, until the ache in her chest burned and the sounds of night were trapped within. She held them there, stilling herself. One, two, three, four, she counted, slower than sheep grazed through her dreamer’s haze as she fell asleep. Five, six, seven. Maybe if she counted high enough, could she cease breathing? Then the pain might go away? And the confusion would vanish . . . But by now, her chest having burst open, she gasped for air like a fish. She gulped life and the scent of the campfire she’d left behind. Which annoyingly reminded her of the fish they had caught and cooked over flame together for their breakfast only days before in the frigid morning air. There had to be more to her than burning pain; more than her broken soul. She wasn’t planning on it. She didn’t mean to. At least, not at first. Because at first it was just her twitching hand, as the favonian breeze caught her hair. At first her fingers just fumbled across her collar, and were picking at the edge. But then she heard a laugh beyond the trees and her fingers caught and it tore. Just a little bit. She wondered what would happen if she pulled it once again. And again. Then with a sharp tug, she jerked hard, palms buried in the fabric, as if dipped in ink. She wanted the cloth all over her hands. She tore the front of her tunic completely in half, with malice, with all the ire bottled inside of her. Lovely it was, but only lovely to someone else. To her, it was dung. What he did, leaving her behind was akin to ripping, tearing, wrenching her apart. And so she mutilated his gift, tearing the fabric into two fraying pieces. She was done. She flung it on the ground. It was oddly satisfying, crushing her soles against the fabric at her feet, covering it with dust, rendering it into filth, like it made her feel. But now she wasn’t wearing his “treasures,” of lovely tunics, of lies and of that like. Now she was free. She was free of him, and the control he had over her. She breathed deeply again. This time, not considering death, but sighing life. With a final forceful kick, flinging the ruined fabric aside, she spun on her heels, making her way back to the Council. There she engaged their advice and they chose to forget her sudden departure. Eventually some went off to bed, but she stayed by the fire. 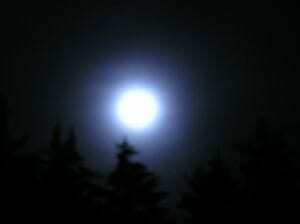 And as the moon continued to rise, the tunic vanished from the dust into the night.